Samsung is set to challenge the iPad 2 with a cheaper, Wi-Fi only version of the 7-inch Galaxy Tab that will land on store shelves by Sunday and sell for $350. The Samsung tablet also arrives just 10 days before Research In Motion's Blackberry PlayBook, another 7-inch iPad challenger, goes on sale at Best Buy and other retailers. Samsung apparently feels the Android 2.2-based Galaxy Tab still has some life left in it despite the fact the company plans on releasing a 10.1-inch version of the Galaxy Tab running Android 3.0 (Honeycomb) later this year. But if you're hoping to wander into your local box store or electronics shop to get your hands on the ultra-cheap Galaxy Tab, think again. Samsung doesn't spell this out clearly, but as near as I can tell, the only physical store carrying the Wi-Fi only Galaxy Tab will be CompUSA. Using Samsung's Website to look for retail locations in various regions across the country there was only one physical retailer available. So unless you happen to live near a CompUSA, your best bet is to buy the Galaxy Tab online from Circuit City, CompUSA, TigerDirect or Frys.com. At the time of this writing, the device was available for pre-order at three of the online retailers excluding Fry's. You can find more information about where to buy the Galaxy Tab here. Despite the fact that the Wi-Fi only Galaxy Tab will be a little hard to find, a $350 7-inch Galaxy Tab is a great price for those unwilling to shell out an extra $150 for the cheapest iPad or Blackberry PlayBook at $500. 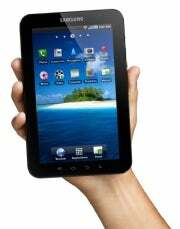 The Galaxy Tab's 7-inch display features 1024-by-600 resolution and runs Android 2.2 (Froyo). The device also has a 1 GHz processor, Adobe Flash Player 10.1, 3.2 megapixel rear facing camera, and 1.3 megapixel front-facing camera. One discrepancy to note is that Samsung's announcement says the Wi-Fi only Galaxy Tab comes with 32GB onboard storage, but my checks with online retailers and Samsung's own Website shows the device sports just 16GB of flash storage. The Galaxy Tab also includes a microSD slot that can support up to 32GB of removable storage. Check out PCWorld's head-to-head comparison of the Galaxy Tab, iPad 2 and Motorola Xoom (video) for more information about the Galaxy Tab. If Wi-Fi only isn't your thing there are other cheaply priced versions of the Galaxy Tab. You can get a 3G version of the Galaxy Tab from Sprint for $200 with a two-year contract or $430 without. Verizon is selling a contract-free 3G Galaxy Tab for $500 or you can opt to pay $200 with a two-year contract just as you can with Sprint. If you're in the market for a sub-$500 tablet, and don't mind picking up a device that doesn't run the latest and greatest version of Android, now is a great time to be looking at the Galaxy Tab.